After a dull dawn rise and overcast day the sun started to show late this afternoon so I headed off to Kimmeridge Bay this evening hoping that it would be enough for a shoot, unfortunately there was quite a lot of low cloud and a sea mist so that put an end to any seascapes. 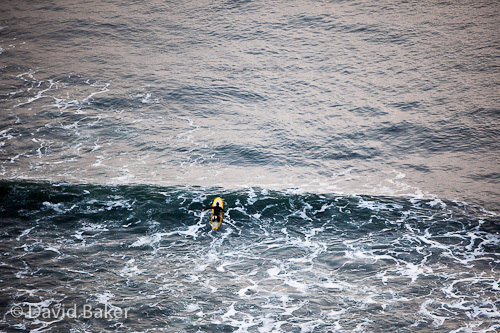 There were lot of surfers around to I walked up the hill to shoot them from an elevated position, great vantage point and certainly scope for some superb shots……if you are lucky enough to own a Canon 500mm f4 lens that is! I did what I could with my 70-200mm and concentrated on scale with the small surfers and huge ocean. ~ by David Baker on 9 October, 2010.